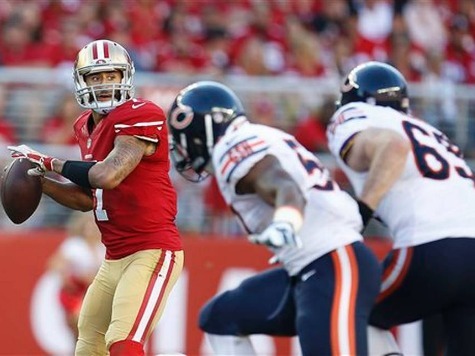 Chicago Bears defensive end Lamarr Houston now says San Francisco 49ers quarterback Colin Kaepernick did use the “N-word” against him to receive a 15-yard penalty for “inappropriate language” in a game two Sundays ago. After the game against the 49ers two weeks ago, Houston said he did not hear anything. But after he got flagged for his own “inappropriate language” penalty (Houston insisted the referee thought he was cursing when he said “back off.”) in Chicago’s win over the Jets on Monday night, he was asked about the Fox Sports report about Kaepernick’s alleged use of the slur. When the paper “asked if he was insulted, Houston said it’s more a ‘cultural thing. '” He also “reiterated that he incensed Kaepernick on the play by saying ‘nice pass’ at the end of a Kyle Fuller interception.” In the offseason, the NFL competition committee reportedly urged officials to crack down on racial or homophobic slurs by using existing rules. KPIX San Francisco has footage of the incident in question, which shows Kaepernick mouthing something at Houston. Kaepernick says “I didn’t say anything racially derogative” to Lamarr Houston last week against Bears contrary to today’s Fox Sports report.